It has always interested me in how dance and the expressive body can facilitate cross discipline practice – both as a means of research and the making of new work. I have a keen enthusiasm to know about and to share in the practice of other arts disciplines. Music is a natural fit for dance and regular collaborating composers include jazz artist Jilly Jarman with the Body Stories activities and percussionist Brendan Murphy for 3 of the site-specific performance projects. Film-maker Christo Wallers has a love for 16mm film and he and I have worked closely on two pieces of work that I commissioned him to make – for RAPT with dancer Viv Wood, whose terrific career has included many performances with DV8 and Michael Clark; and of me developing unsighted tactile responses to defining a sense of place that became a part of the solo work Divided. between. displaced. newfound. Often beginning my own movement exploration with improvisation I also feel a great affinity with abstract painting and developed a shared practice of gesture and mark making with Linda Kent. 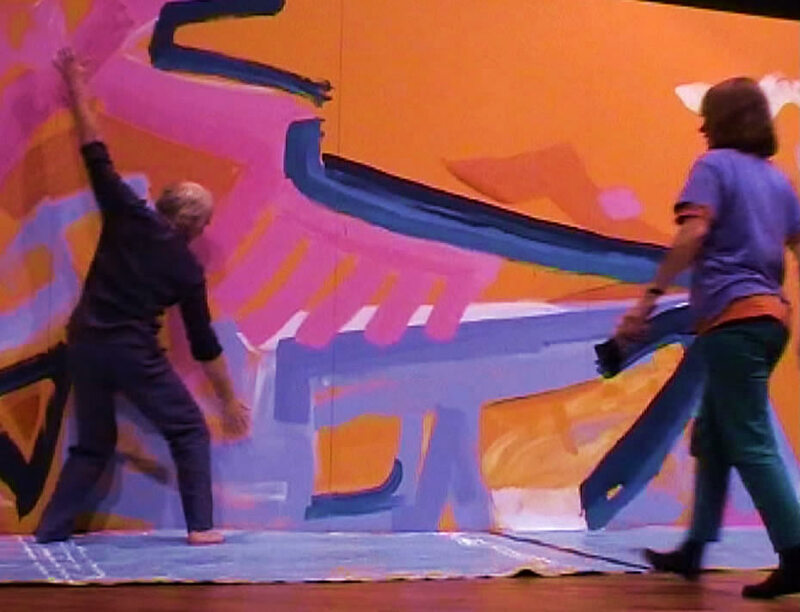 Our collaboration commissioned by Queens Hall Arts Talking Without Words engaged our powers of observation and interpretation of each other's elements of colour, composition and movement towards a large painting 3 x 7 metres and a 45 minute solo performance. Both Linda and Christo have also collaborated with me on two site-specific performance projects. Similarly, I am drawn to modern poetry because often with few words it conveys much about what it is to be human and alive today. I try to do the same with my own work and have discovered much in a workshop process I share with the writer Sean Burn where we play off each others' emerging ideas to bring new work into being. You could say we are pollinating ideas and each other's practice and I have embraced this concept further afield. In 2010 I was commissioned by Creative Partnerships to collaborate with Dr. Sarah Atkinson, an anthropologist and social scientist at Durham University. We were asked to observe and write about the managing of spatial dynamics in arts-based practices with school children: an inter-disciplinary exploration of engagement, movement and wellbeing. Our resulting co-authored paper was published by the Routledge, Taylor and Francis Group. In 2012 we joined with choreographer Claire Pencak and Dr. Karen Scott of the Centre for Rural Economy at Newcastle University where Claire had developed a residency exploring dance as a tool for research. This collaboration led to an activity-based talk and discussion under the title of Pollination as part of the Ignite CPD programme at Dance City in Newcastle.